Three-time ARIA nominee and 2014 CMC Female Oz Artist of the Year Jasmine Rae releases ‘When I Found You’ - the second official single from her ARIA Top 50 album and ARIA Country #3 album, Heartbeat. Jasmine wrote ‘When I Found You’ with one of her current band members, keyboard player and songwriter Beau Golden and Sean Carey, an original member of Thirsty Merc. In the writing session, the co-writers reflected on the many conversations Jasmine had with Amber in the weeks/months leading to the big day. It was those conversations which formed the lyrical basis of the song. 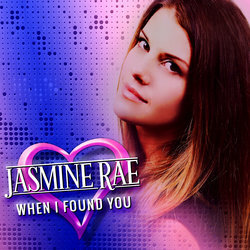 ‘When I Found You’ follows the Heartbeat album’s opening single and title track, which became Jasmine’s eighth #1 single – going all the way to #1 on both the official Australian Country Airplay chart as well as the CMC Top 30 Countdown. ‘When I Found You,’ is being described by many as the ultimate wedding song. Featuring Jasmine’s stunningly soulful vocal performance, the song’s lyrics convey all the beautiful and loving things people feel and want to say to the partner they love.